The regatta will be governed by the Racing Rules of Sailing. Sailors may purchase a lunch at registration for $5.00 or they are welcome to bring their own. The lunches and water will be given to the sailors on the water. 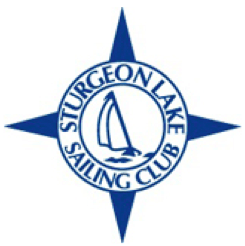 The course for Lasers/Radials, 420, Feva, and Handicap classes will be set off the point of Sturgeon Lake. The course for the Optimist and Pico classes will be set in front of the club. Both courses will be explained on the Sailing Instructions (offered at the registration table) and drawn at the Skippers Meeting at 1000. The marks will be large orange tetrahedrons. The Start line will be between a yellow cylindrical mark and the Tanzer 22 Committee Boat. The Finish line will be between an orange tetrahedron and the Tanzer 22 Committee Boat. Maximum 8 races for all classes except Pico and Optimist. Maximium 5 races for Pico and Optimist Classes. No races will be started after 1600. Low point scoring system. One drop race if 5 or more races are completed. Sailing Instructions will be provided Saturday morning to competitors upon registration. The SLSC will not be distributing bottled water on the course nor on land. Sailors will be asked to bring their own re-usable water bottles, and there will be boats designated for refilling bottles between races. This is the more sustainable option and the way of the future for all regattas to come!